Make Your Own Gourmet Chocolate Goodies! Mmm...Chocolate! Whether you are looking to make something extraordinary for yourself or a treat for someone special you can't go wrong with chocolate covered goodies. Most recipes are quick and easy, and make great all-occasion gifts for just about anyone. Even a novice can make impressive looking gourmet treats in no time! Give it a try and you will see what I mean. When you pick out your chocolate, get the best quality you can find. This does not necessarily mean the most expensive - there are many great options available in the candy aisle or the baking section of your grocery store (I like Dove or Ghirardeli). When you’re shopping for white chocolate, make sure that the words “cocoa butter” appear in the list of ingredients. Many brands contain absolutely no cocoa butter, using instead sugar, hydrogenated oil, and artificial flavorings. A higher quality chocolate will make your treats taste truly "gourmet". You don't have to limit yourself to plain chocolate, either. Add some flair to your treats by experimenting with different flavored baking chips or candy, such as butterscotch or mint chocolate. Put wax paper on a cookie sheet. Make sure there is storage room in your refrigerator, or you may cover the cookie sheet and put it outside (if the weather is cold enough). Put the chocolate pieces and shortening in a saucepan on the lowest heat setting and stir frequently until melted. Or, put the chocolate pieces in a microwave-safe bowl and microwave for 1 minute and stir. If the chocolate has not completely melted, return to microwave for 30 second intervals until there are no lumps when stirred. Dip items in the chocolate using tongs or other suitable tool. Once the item is covered in chocolate to your liking, take it out. Tap off the excess chocolate. Put the finished items on the wax paper. Once the sheet is full put it in the refrigerator or outside until the chocolate is solid. For contrast, you can put melted white chocolate, butterscotch, or other colored candy pieces in a bag and snip off a corner. Drizzle the melted candy over your chocolate covered treats. If you are covering something that you want to keep crisp, like potato chips or crackers, be sure to cover the entire piece with chocolate to keep the air from getting to it and making it stale. You can use a pastry brush to brush the chocolate over any uncovered parts. If you are not going to consume your candy immediately, you want to be sure that you store it properly in a cool, dry place in an airtight container to maintain as much freshness as possible. Many chocolate covered foods can be kept for several weeks to a few months depending on how fresh the original product was and how stable the temperature is for storage. Make one or make them all! Put together an assortment of goodies for a gift basket, or to set out at your next party - They're sure to be a hit! 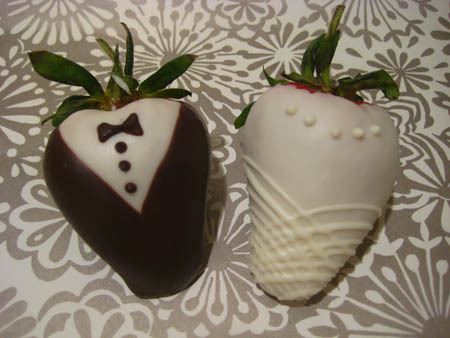 If you need something spectacular for a formal event, check out this tutorial for making Chocolate Covered Tuxedo and Wedding Dress Strawberries. They'll be sure to impress everyone on the guest list! Looking for more great ideas for your mom? Try A Mothers Day Gift Basket - the perfect gift for the perfect mom.